After the last update, no critical bugs have appeared. Looks like the transition to Game Maker Studio was a success. I switched my focus to contents production again. Both work and some personal things have consumed most of my free time this month, but I managed to get some progress going on Area 4. Some features and assets in that area are being revamped. It's not going to be as complex or big as Area 3, but it has it's own unique moments. I'll be posting some screenshots once I have the new tiles and backgrounds in place. Area 5 (the new, original area) is also under progress. In collaboration with the sprite artists, we are in the process of turning the place from a barely functional place where you find items, to a location with the purpose and personality that other areas have. This is mostly planning new features and special game mechanics, under the limits of what can be done with the engine. I would like to thank all the awesome people who provided feedback during the last couple of demo releases. The game is very stable now, and it runs very well on Linux also. Your feedback helped a lot to finish the transition to the new engine. BTW, people having trouble running the game on Windows XP, try making a shortcut to the executable, and add "-software" at the end of the target field. It helped in some cases. I'll be posting some screencaps of new contents soon. I have been following the project for about a year and I must say it is very impressive work. This project is so well done it is hard to distinguish it from a Nintendo production. Please keep up the good work - it would kill me to see such an awesome project die! I know this might be a tad late and a bit odd to inquire about however I have high interest in this project and was wondering if there was any way I could help you in your endeavours as the project is something I most certainly would love to see come to success. Is there no mac relase planned? playing this via wine glitches the hell out of the map screen,aside from that,this is great work,and feels just like what nintendo would do if they were to remake M2,or even better! So far along, and my excitement for this project never fades. You may very well be the only person doing a proper job keeping the Metriod fanbase alive and relevant, and I thank you for that. I wait for your news every months ! Happy to see that the project continue ! Good luck ! I have been watching this project for a couple of months now, and I will say I find it MUCH better than the original, mainly because of the mini-map. I think I remember playing this a few years ago, but I don't really remember. I'm really excited for this fan game. If it's not too much trouble to ask that if you're still making the fan game after about 4-6 years (probably be done by then, but you never know) I am going to be a video game developer (I'm currently 16 years old) and after high school going to get a degree in Video Game Development, like I said. If you are still working on it, could I somehow join you in the project or maybe future projects? Thanks for your consideration. Again, can't wait for the project to be completed! It does bring a smile to all those who has been following you through 4+ years of this very fan game, and when you look back it is very noticeable that this project has came a long ways! Obtaining useful programming tools an techniques, meeting skilled people who're willing to help, and even sharpening your mind to keep improving. You and your comrades have made all of this possible, and it'll be recognized as one of the most successful fan-game amongst the gaming history! this is a very awesome thing you are doing. i really, really, really, hope the project will be complete. i make games in my spear time, but i have never completed any. each game i start is influenced by great ideas, but i am alone on these projects and my social life sometimes get in the way. you guys are inspiring me to continue. to get motivation, i will start uploading my games. You are the best! ^_^ I've been following this project for sime time and I'm amazed and the level of craftmanship you have. Thank you to all guys (and gals) who contributes to this. I have been watching your project for a long time now, and playing your demos. This is incredible work, at least as good as any Metroid game produced by Nintendo. Keep it up, and thank you for making such an incredible Metroid game! Thank you for the update, we are all looking forward to the next demo and eventual completion of the game! Hi Doc, just was curious if there was a way to donate for this project now? or do you have plans to allow donation when you launch the game? You are a god among men to Metroid fanatics such as myself and deserve to be compensated by the community for your work. Hey, I think I just completed the demo, it was amazing. Or is there a way to access the area left of the ship already?? could you possibly make the things that you shoot to reveal items in chozo statues solid? cuz when I jump onto those things before I shoot them to reveal the item inside I just walk right through it, this isnt a big issue but they should be solid, they were in zero mission. It's looking good. I finally played through the whole of the original Metroid 2, and I can't wait to see what you do with the remainder of the game. Lots of possibilities. I've been playing AM2R for a while and I've watched it grow. This game is an amazing piece of work, but I noticed something that would be beneficial to the game. Health bars to all the bosses, such as the Ancient Guardian, Arachnus, and the Torizo. Maybe even metroid battles themselves. But anyways, keep up the good work! Part of what made the original games feel ominous and realistic was the fact thinking during the battle, is he almost dead. This has been my most enjoyed video game experience since Mega man 9, and way better than any of teh Metroid prime games to me. Thank you! Did anyone notice that the time of day shifted once you beat the metroids at the GF site? It was a real nice touch and I hope it becomes night just before the Queen battle. Hard mode's good, but there should be hyper mode. Are you able to estimate the release of the new demo. I'm dying to play area 5. Still not ready. It's been more than 5 years. I know it's gonna be great, but I'll only come here again when the full version is ready. You're doing great work. Can't wait for the next update! Hey, kind of an unrelated question. Have you ever considered getting a Tumblr blog to post your updates to? I think hosting your updates on Tumblr would give AM2R a ton more publicity, and possibly make things more managable. Just a suggestion. Loving the progress on the game so far! played through the demo like 2 weeks ago... was so upset to see "to be continued" at the end! waiting patiently for the next areas to be finished. keep up the good work! uff ya estoy super mega impaciente :D ademas por adelantado :3 Feliz navidad doc . Welp, it's not the longest wait we've had for some kind of update. Getting pumped for the new update. 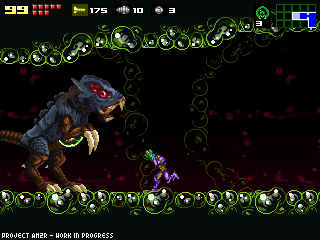 It's not imperative, but I noticed in the description that you say you want to give it the solitude of super metroid. Part of the solitude was the deep immersive music. The game music has potential, but there needs to be deeper notes making harmony with the higher notes. By the way, thanks for allowing for the ability to change the in-game music. I am currently creating a playlist of old metroid game music. So when is the next update up? Well I would just like to say you did a good job on this.